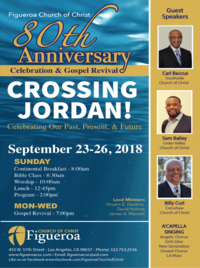 Plan, pray & participate with us as we gear up for the 80th Anniversary Celebration & Gospel Revival of Figueroa Church of Christ. 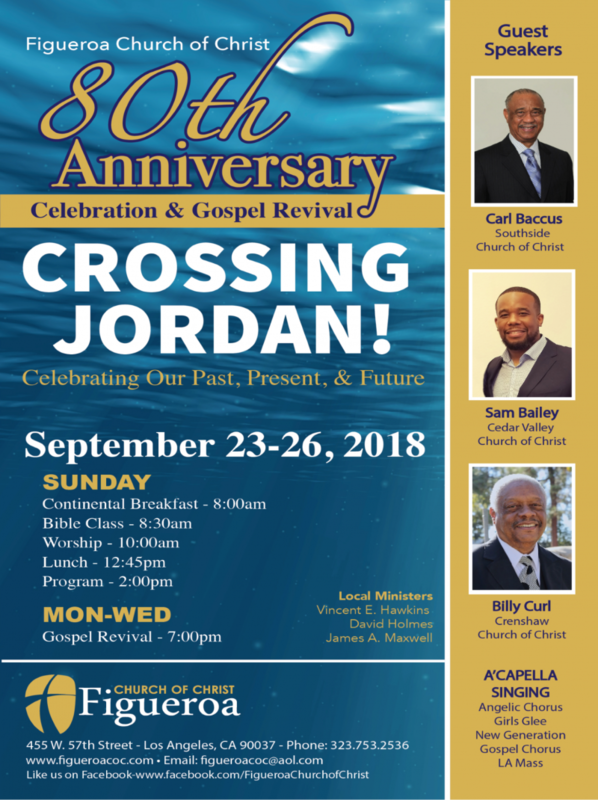 God has been more than good and we will pause to thank Him for allowing us to 'Cross Jordan!' We will have inspiring words delivered to us by three beloved friends of the Figueroa Family, Carl Baccus, Sam Bailey & Billy Curl. Dates: September 23-26. Click image to the right to enlarge flyer. For more information contact the Church Office. To acknowledge, celebrate, and thank God for 80 yrs. of service to Christ, church and community! To remember, reflect, and recognize ALL who made this journey possible!